Jennifer Lopez joins a long list of Hollywood hotties who love dating younger men. Who else likes them young and impressionable? Jennifer Lopez isn’t exactly known for staying single long, so it wasn’t surprising when she was spotted with Bradley Cooper just days after her split from Marc Anthony. The J. Lo and Cooper relationship may be over now, especially since the American Idol judge was spotted with a hot young dancer, Casper Smart. The dancer — said to be in his mid-20s — is on Lopez’s dance team and has appeared in Step Up 3D and Glee. The mother of twins Max and Emme has dated younger men in the past — her second husband, Cris Judd — was also younger. Who else likes to test the younger waters? Plenty of leading ladies! Madonna is now the poster woman for older woman/younger man relationships. She dated Brazilian model Jesus Luz — 28 years younger — for a year. The pop star is even 14 years older than the model’s own mother. Madonna then moved on, dating 24-year-old British dancer Brahim Zaibat. Why all the young ones? It might have something to do with insecurity. 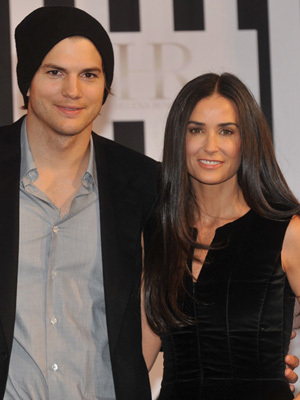 Demi Moore and Ashton Kutcher made a lot of heads turn when they married six years ago. Why? He’s 16 years younger than her and closer in age to Moore’s daughters. “As marriage goes, I think most people set getting married as the goal, as opposed to being married, which is a different thing,” Kutcher told CNN’s Piers Morgan in an interview. We’re all well aware they are no longer a couple. Ashton is now dating Mila Kunis, and there’s already talk of wedding plans. Mariah Carey’s first marriage to Tommy Mottola was one of the typical older man/younger woman relationships. She flipped the script on her second marriage, marrying Nick Cannon, who is 12 years her junior. Now, the pair have “dem babies” together and are happy. “It’s a different time in my life. And nobody will ever be able to steal my spirit again. So I’m just happy to be in love and to be here,” she told Barbara Walters in October. As for Cannon? “When he’s nice, he’s the best guy in the world,” she joked. Ellen Barkin has two loves in her life these days: Twitter and her 26-year-old boyfriend, Sam Levinson. Barkin, 57, first met the family when Levinson’s father directed the actress in Diner nearly 30 years ago. “They go out, they’re photographed together, they don’t keep it secret,” said a source in May. “It works, but it’s weird,” another said. Barkin is even acting in Levinson’s directorial debut — Another Happy Day — and she’s very open with her praise for the young scribe. Legendary comedian Carol Burnett refused to feel bad for marrying her third husband, musician Brian Miller, in 2001. Miller is 23 years younger than the 78-year-old television star. “Look at our friend Clint Eastwood [who married a woman 36 years younger], look at our friend — I say, if it’s good enough for the fellows, it’s good enough for the girls,” Burnett told Barbara Walters during an interview. Older woman/younger man: Cute or creepy? Share in the comments below! Meghan Markle is Getting Bullied, Why Aren’t the Royal Women Defending Her?